Both hydrogen peroxide and bleach can clean household surfaces effectively, since both function as powerful bleaching agents. Both have the ability to kill mold and bacteria, both can remove difficult stains, and both brighten fabrics if used properly. However, the two do have important fundamental differences that every homeowner should consider when preparing to use one or both of these products. Choose your solution. Bleach is more effective in killing mold, and can disinfect surfaces more quickly than peroxide. On the other hand, peroxide is natural and oxygen based, perfectly safe for the environment, and contains no harsh fumes. Do not mix bleach and peroxide, because peroxide is unstable and bleach is a catalyst. The bleach will cause the peroxide to decompose, rendering both ingredients ineffective. Put on the proper safety gear, if necessary. If you decide to clean with household bleach, start by putting on a pair of rubber or latex gloves. 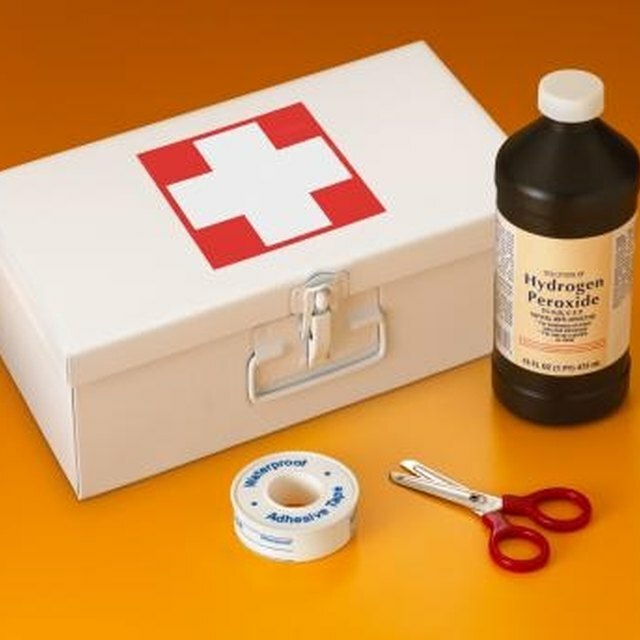 Hydrogen peroxide will not harm your skin, but you should put on a pair of safety goggles if you plan to spray it from a spray bottle, because you want it to avoid contact with your eyes. This goes for bleach as well. Dilute your choice with water, if necessary. Hydrogen peroxide (in its 3-percent concentration) is safe to use full strength, but household bleach requires dilution. For an all-purpose household cleaner, Reader's Digest recommends mixing 1 tbsp. bleach in 1 gallon of hot water. If you want to attack mildew on tiles, mix equal parts bleach and water. If you want to attack mildew on painted surfaces, mix 1/4 cup bleach and 2 cups water. Use 1 cup bleach in 2 gallons water for stones and cement, because these surfaces may be permanently discolored by excess bleach. Pour the bleach or peroxide solution into a spray bottle. Spray the solution over dirt, stains or mildew. If the area requires disinfecting (such as a mildewed surface), allow the solution to sit for about 15 minutes before you rinse. You can also apply your solution in other ways. For example, if you have stained fabrics, add a cup of peroxide or a cup of bleach to the bleach dispenser of your washing machine (use color safe bleach if necessary). Peroxide is always color safe, and you can use it to spot clean by applying it to a cloth and dabbing stains on fabrics, carpeting or wood. Both bleach and peroxide are bleaching agents and may cause permanent discoloration to household surfaces if you fail to rinse them. After using bleach or peroxide, rinse the surface with warm or hot water applied from a cloth or spray bottle. Then, if you're cleaning a porous surface like carpeting, dry the surface to prevent mold from forming.